Oh man, I couldn’t imagine if devices today had that sort of haptic and audible feedback. It’s a pleasure to see how devices worked and sounded in the past. My funnest sound from the past was when my personal computer drove the IBM Selectric the one with the ball. Just watching the ball move change its head to hit the correct letter was amazing. Devices still make sound, it’s just display that don’t, except for some non LED monitors that develop an annoying buzz or whine of course. Wow that sound is very satisfying. I remember one of the first digital volt meters I used was with a part time job whlie going to tech school in the late 60’s. Don’t remember who made it, but remember how it worked. It had a mechanical counter much like a mechanical speedometer, that was drive by a motor. The motor also turned a multi turn pot to balance a bridge. It was always fun to watch wheels spin and listen as the motor spun up real fast to get close to the final value. As it got closer you would see the counter slowing down to the final value, then you would see the last digit slowly turning with any slight change. It wasn’t as loud as the stepping relays in the edge-lit unit, But,it was auto ranging, and you could hear the relays click as it selected the correct range and then the motor started to spin. Shounds good, I would quite like one too. Next time I have parts, money, time, I’ll make one… oh, maybe next year. Staying thst I have a couple of those old mechanical phone switches somewhere. I wonder if I can 3D print them. You can 3D print long term reliable contacts? Very nice! Well it would sound right. Thanks for this. I actually used one of these when I worked at North American Aviation in the mid 60’s. It was the first digital voltmeter I ever had experience with. 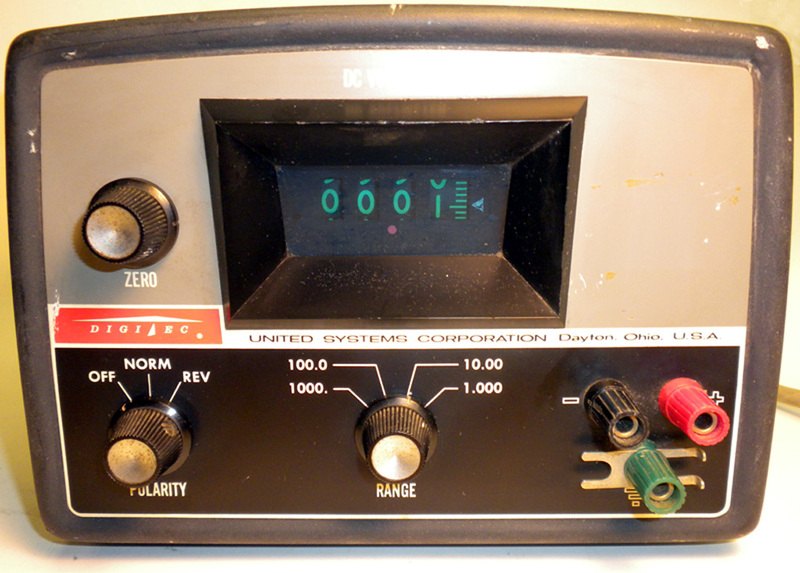 I had one of the NLS meters, think it was a model two. Had those stepper relays in it. Had a bad HV cap in it when I got it. (For the tubes.) Remember when I subbed in another HV cap and fired it up… Those steppers took off and rather startled me. Still own a Cimron 6200 DVM (DC only, without AC or Ohms plugins, which I also have.) Anyway it has same stepper null “system” only it uses reed relays on the input ladder. Not near as noisy as the rotary steppers. But still startling to those unused to hearing noises come from a DVM. Why do I hang onto it? Still the only meter I own that will read a tenth of a microvolt!